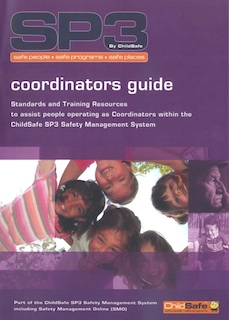 ChildSafe has produced a range of guides to meet the different requirements of people working or volunteering in community organisations. These are available to subscribing organisations and their members. 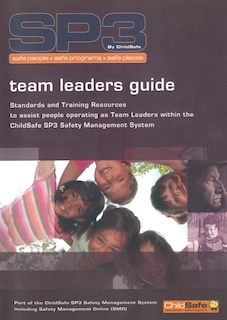 Each guide inter-relates to the primary SP3 standards, with reference to SP3 procedures, forms and other related resources to assist you to practically attend to safety. The four guides and the kit are explained in the table below. 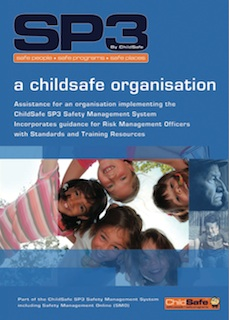 To properly implement ChildSafe’s “SP3” approach, everyone in your organisation needs to have relevant materials for their level of responsibility. 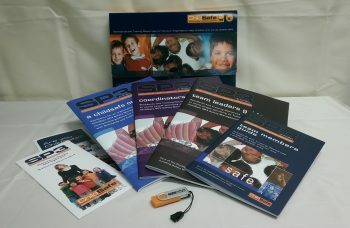 Branded or customised editions of our publications can be discussed with subscribers, by contacting ChildSafe. 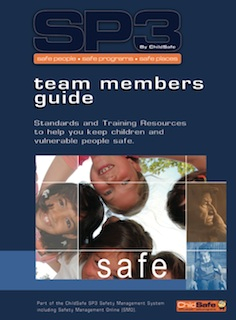 This guide supports leading teams of leaders and details safety planning of programs, appointing Team Members, training and incident response. This guide supports oversight of safety management consistent with established standards, policies and procedures. Freight charges will be added to your order. Price on Application for larger orders. Sent via courier (PO Boxes by exception). Order Entry Details: Please enter the item quantities required above, and your contact details below. Terms: Invoice sent by email, payable in 14 days. Prices include GST.